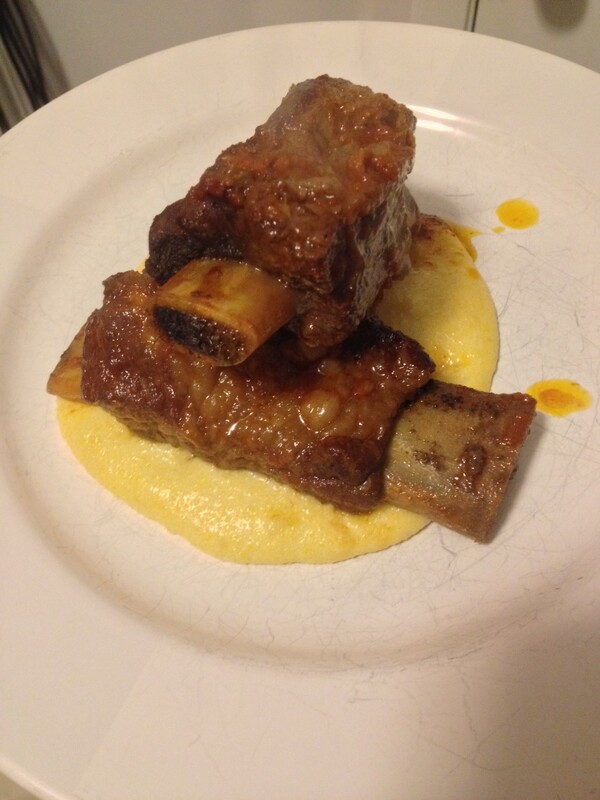 I made these short ribs for a private dining client a few weeks ago. The recipe is a little time consuming but certainly easy and approachable enough for any home cook. I used one of my favorite cooking methods in this recipe, braising. Braising basically means taking a tougher cut of meat, browning it in a hot pan and then covering with some sort of richly flavored liquid and cooking low and slow for a few hours. It may not be best when you’re looking for a fast meal after work, but these short ribs will certainly shine at your next Sunday dinner or potluck. Short ribs often taste best a day after resting, so if you can, get them through the three hour braising, cool and then refrigerate them. The next day, pop them in the oven for 30 minutes and you’re set. They’re worth the extra time and effort. 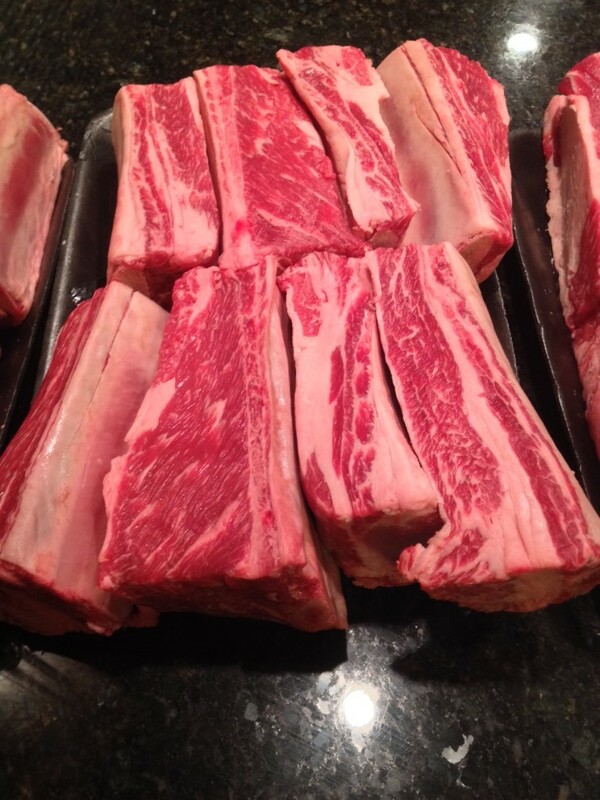 Big, beautiful short ribs before I seasoned and started browning them. Seasoned and in the smoking hot pan, getting browned and crusty on all sides! This shot was taken when I was preparing this recipe for a private dining client. After all the short ribs were browned, I braised them in the oven for 2 1/2 hours. Cooled them in the braising liquid overnight. All the client had to do was heat in the oven for 30 minutes and then serve! Braised Short Ribs served over creamy, cheesy polenta. Polenta recipe will go up one of these days. Season both sides of short ribs generously with salt and pepper. Add oil to a large pot over medium-high heat. 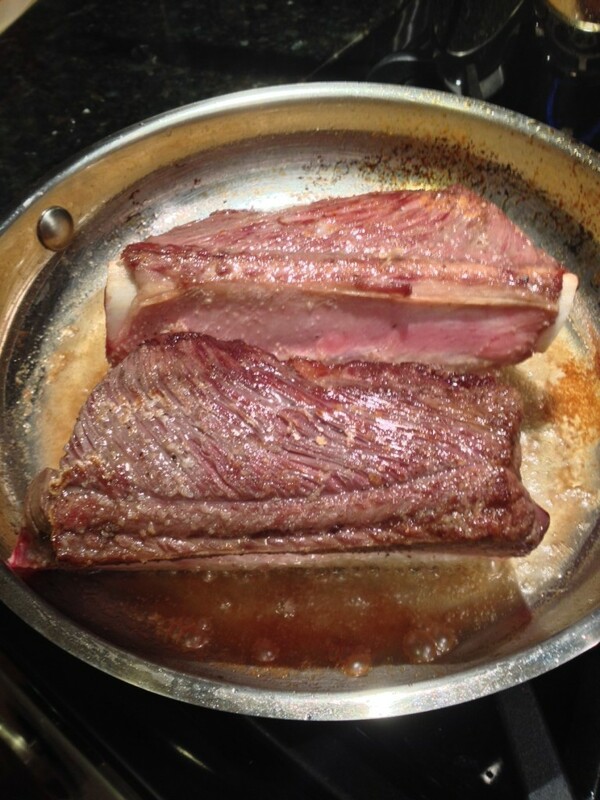 When oil is hot, add short ribs to pot and brown each side for 4 – 5 minutes. Be careful not to overcrowd the pan; you may have to work in batches. While the short ribs brown, purée vegetables and garlic in a food processor. Set aside. 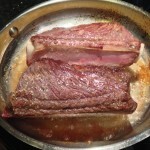 When all short ribs are browned, remove from pot and set aside. Add vegetable purée and thyme. Season with pinches of salt and pepper. Cook for 10 minutes, stirring often. Add tomato paste and cook for another ten minutes, stirring often. Add red wine and stir well, being sure to scrap the bottom of the pan. Cook until wine has evaporated, about 3 – 4 minutes. Add beef stock, bring to a boil and reduce to a simmer. 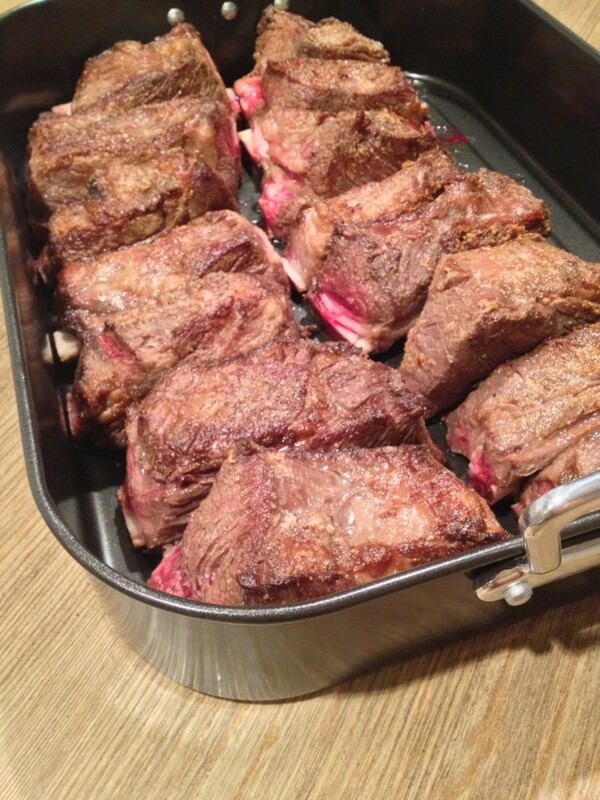 Arrange reserved short ribs in a large ovenproof casserole dish. Carefully pour stock and vegetable mixture over short ribs. Cover and braise in oven for 3 hours, turning short ribs once halfway through the cooking process. Remove cover and roast for another 30 minutes. Remove from oven and serve drizzled with some of braising liquid. for 30 minutes until hot throughout.